Each day we breathe about 20,000 times. All of this breathing couldn't happen without help from the gas exchange system. With each breath, you take in air through your nostrils and mouth, and your lungs fill up and empty out. As air is inhaled, the mucous membranes of the nose and mouth warm and humidify the air. Carbon dioxide is the waste gas that is produced when carbon is combined with oxygen as part of the body's energy-making processes. The lungs and gas exchange system allow oxygen in the air to be taken into the body, while also enabling the body to get rid of carbon dioxide in the air breathed out. Respiration is the process of releasing energy from the breakdown of glucose. Respiration takes place in every living cell, all of the time and all cells need to respire in order to produce the energy that they require. During the process of respiration, oxygen is ingested and chemically broken down, or oxidized, to provide energy for the living organism. This process takes place in the mitochondrion of the cell. The end process is the formation of energy and the expulsion of carbon dioxide, water vapor and heat. For humans, oxygen is inhaled through the lungs and broken down as carbon dioxide is exhaled, while with plants, the opposite occurs, and carbon dioxide is ingested and oxygen is produced instead. There is an important distinction between plants that absorb carbon dioxide and animals that inhale it. For plants, their process is referred to as cellular respiration while respiration that solely inhales oxygen and emits carbon dioxide is simply referred to as respiration. This process happens for all kinds of living creatures. Mammals experience it in the lungs, fish experience it in the gills, earthworms experience it in their skin and amoebas experience it in their cell surface. Respiration is a chemical reaction that happens in all living cells, including plant cells and animal cells. It is the way that energy is released from glucose so that all the other chemical processes needed for life can happen. 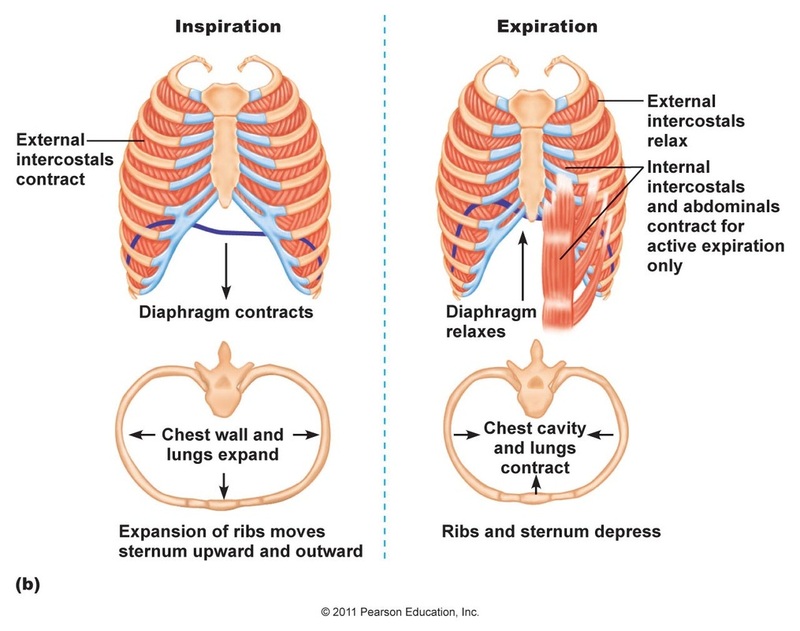 Do not confuse respiration with breathing (which is properly called ventilation). The respiration process is carried out in two ways in living organisms; Aerobic and Anaerobic. This is a very complex process and involves chemical reactions during which oxygen is used in converting glucose into carbon dioxide and water. In this process energy is generated in the form of ATP, which are the carriers of energy. 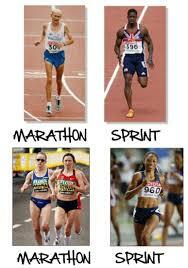 The start and end of aerobic respiration is usually the same if the glucose is to be broken down. Although burning is a type of aerobic process, the energy released in it is heat. But in aerobic respiration the release of energy is done in controlled way and hence very little energy is wasted in the form of heat. Most of the energy released is utilized by cells for growth and other activities. It is carried out by expanding and contracting the ribcage using the muscles located in between the ribs (these comprise the meat eaten when people have ribs from pork or whatever animal). The diaphragm is another muscle that participates in this process. It is a thin layer of muscle, separating the thoracic cavity from the abdominal cavity. When the diaphragm moves downwards it pulls air into the body as if it was the plunger of a syringe. 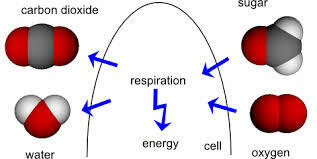 Respiration is the chemical reaction that provides the energy that makes the organism function. It occurs in the cells, more precisely in the mitochondria. Organisms need energy to move, to keep warm, to perform digestion and other chemical processes. Respiration is a chemical reaction that tranfers chemical energy contained in the glucose molecule to the ATP molecule, which is the energy "currency" of living things. Diffusion is the movement of particles from an area of high density to an area of low density. In this way gasses will move from an area dense with gas to an area of low density. In the circulatory system oxygen enters the blood and carbon dioxide leaves the blood via gaseous exchange. Gasses move across the walls of alveoli to an area of lower density than they are in: Oxygen moves into the blood as there is a low density of oxygen in the blood; Carbon dioxide moves into the lungs as it is an area of lower density. This is actually a form of excretion would you believe it, as carbon dioxide is a metabolic waste product from respiration. The thorax is the part of the body that lies between the neck and the abdomen. Dust and foreign particles, including bacteria in the air, are trapped by the hairs in the nostrils as well as by the mucus on the mucous membrane. As air passes through the nasal passages, it is warmed and moistened before it enters the lungs. The air in the nasal passages enters the pharynx, then to the larynx, and then into the trachea. The trachea lies in front of the oesophagus. It extends downwards from the larynx into the chest cavity. The lower end of the trachea divides into two tubes, the bronchi (singular: bronchus), one to each lung. Each bronchus divides repeatedly and ends in very small, fine bronchioles. Each bronchiole ends in a cluster of air sacs called alveoli. Each lung is in a pleural cavity. The pleural cavity is lined by two transparent elastic membranes called the pleura (singular: pleuron) or pleural membranes. The inner pleuron covers the lung. The outer pleuron is in contact with the walls of the thorax and the diaphragm. A thin layer of lubricating fluid between the pleura allows the membranes to glide over each other easily when the lungs expand and contract during breathing. Within the lungs, the bronchial tubes divide repeatedly, giving rise to smaller tubes called bronchioles. They each end in a cluster of air sacs or alveoli (singular:alveolus). Thousands of alveoli are found in the lungs, providing a very large surface area for gas exchange. The chest wall is supported by the ribs. They are attached dorsally to the backbone in such a way that they can move up and down. The ribs are attached ventrally to the chest bone or sternum. Two sets of muscles, the external and internal intercostal muscles, can be found between the ribs. They are antagonistic muscles. When the external intercostal muscles contract, the internal intercostal muscles relax and vice versa. The diaphragm, which is a dome-shaped sheet of muscle and elastic tissue, separates the thorax from the abdomen. When the diaphragm muscles contract, the diaphragm flattens downwards and whey they relax, the diaphragm arches upwards again. The diaphragm contracts and flattens. The external intercostal muscles contract while the internal intercostal muscles relax. The ribs move upwards and outwards. The sternum also moves up and forward. The volume of the thoracic cavity increases. Air pressure in the lungs causes them to expand to fill up the enlarged space in the thorax. Expansion of the lungs causes the air pressure inside them to decrease. Atmospheric pressure (pressure of air outside) is now higher than the pressure within the lungs. This causes air to rush into the lungs from outside. The diaphragm relaxes and arches upwards. The internal intercostal muscles contract while the external intercostal muscles relax. The ribs move downwards and inwards. The sternum also moves down to its original position. The volume of the thoracic cavity decreases. The lungs are compressed and air pressure inside them increases as the volume decreases. Air pressure within the lungs is now higher than atmospheric pressure. The air is forced out of the lungs to the exterior. Lungs contain millions of microscopic air sacs called alveoli. Each alveolus is made from a single layer of thin, flat cells called alveolar epithelium. This means there’s a short diffusion pathway (which speeds up diffusion).There is a large number of alveoli in the lungs, which means there’s a big surface area for exchanging oxygen (O2) and carbon dioxide (CO2). The large number of alveoli means there’s a large surface area for gas exchange. The alveoli are surrounded by a network of capillaries which are also single layer thin. Explain the biological consequences of smoking in relation to the lungs and the circulatory system, including coronary heart disease. Tar - Blocks up alveoli, making gas exchange more difficult. Also clogs up cilia (little hairs lining the lungs, whose job is to “wave” and remove mucus and trapped bacteria out of the lungs). Nicotine - Speeds heart rate and damages arteries, causing furring of artery walls (atherosclerosis). This leads to heart disease and vascular diseases. It is also addictive. Carcinogens - Damages the DNA of alveoli cells. This can lead to them reproducing faster than normal, which will cause a tumour to form. The tumour is the start of cancer. Carbon Monoxide - Attaches permanently to haemoglobin, reducing the ability of the blood to carry O2. Poisons - The list is endless. There are over 5000 poisonous chemicals in cigarette smoke (e.g. benzene, arsenic, lead, cyanide etc). Revise the respiratory system on Bitesize. Revise gas exchange on Bitesize. This 3D medical animation shows the health risks of smoking tobacco.